Indoor bounce houses are a ton of fun for kids, and they can also be sanity savors for moms, especially on a Summer rainy day or a super-hot afternoon. They are air-conditioned and provide children with great exercise and plenty of fun — plus, they get to hang out with other kids without officially having to schedule a play date. 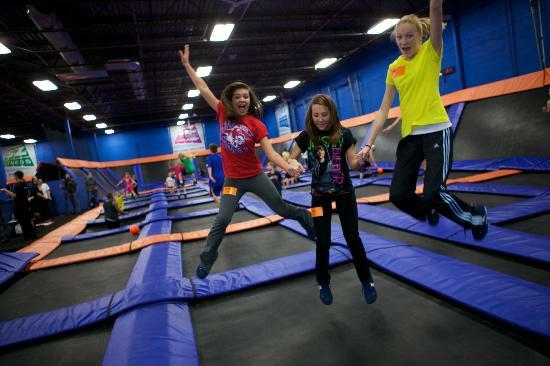 Over the years, I’ve visited my share of indoor bounce houses, and after many hours of observation, I’ve noticed eight main types of moms that frequent these establishments. From the energetic mom who bounces right along with her kids to the mom who scans the facility for a comfortable chair to sit in the moment she arrives, one thing all of these awesome women have in common is that they are there to give their kids a fun and memorable outing. This fun mom isn’t afraid to “jump up, jump up, and get down” with her kids and break a sweat. You go, girl! So glad you have all that energy. Like a fierce mama bear out in the wild, this mother is watching her child’s every move and is there to swoop in when her amazing mommy senses detect an accident about to happen. This mom is ready with her phone or camera to capture every awesome bounce and flip her kids do. You can also almost guarantee these photos will be posted to her social media immediately. This mom will usually find a nearby comfortable chair to sit in where she can relax while her kids run around and play to their heart’s content. It’s a win-win! This amazing mom knows her kids very well and comes prepared with their favorite snacks and drinks. Forgot to bring some snacks for your kids? No worries. This mom has you covered, because she brings more than enough to share with her children’s friends as well. This is another well-prepared mother. You will usually find cartoon character Band-Aids, Neosporin, hand sanitizer, and even lollipops in her purse. They are ready to go for any kid that gets a boo-boo. This mom has a special knack for turning everyday outings into educational lessons for her kids. She is great at keeping her kids’ bodies and minds stimulated. This mom feels comfortable with leaving her older kids alone at the bounce house while she leaves for a bit to run errands, shop, etc.